Welcome to startcooking’s ultimate (and updated) guide to cooking a turkey! The thought of cooking your very first Thanksgiving dinner can be a bit intimidating, but with just a bit of advance planning you can definitely pull it off. Roasting a turkey is very similar to roasting a chicken except your oven temperature should be set at 325 degrees and not 400 degrees. Go have a look at that video of mine before you begin. The USDA’s Fact Sheet on Poultry Preparation is also an excellent resource. It includes information on buying, defrosting, cooking, storing, and an emergency hot-line to call for advice as well! 1. What Kind of Turkey Should You Buy; Fresh, Frozen, Whole, or Just the Breast? 2. What Turkey Size Should I Buy? Calculate one pound per person. So, for a group of six, a six-pound turkey should suffice. Go for one that’s bigger if you want to have leftovers. 3. What’s that Already Stuffed in my Turkey and Do I Eat It? When you remove the turkey from its wrapping you will have to reach into the cavity and remove the bag that’s inside before you cook the turkey. (I show this in my Roasted Chicken video and — yes — there is an “ick” factor here!) The bag usually contains the neck, liver and various edible innards of the turkey. These parts can be simmered in seasoned water on the stove. They are then strained and the flavored water is used as stock to make the gravy. (Pioneer Woman shows how to do this here.) If this is the first turkey you have ever cooked, I am going to recommend tossing this bag away and using store-bought gravy. 4. What Kind of Pan Do I Need to Cook the Turkey and How Long Do I Cook It? 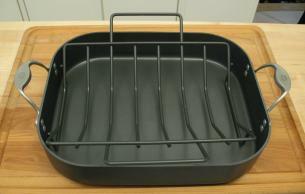 A roasting pan with a V-shaped rack is your best bet – but they are expensive. The rack elevates the turkey, allowing the juices and fat to drip into the pan. Many turkeys come with a single use thermometer that pops up when the turkey is done. You can also use your own meat thermometer or you can buy a single use pop-up thermometer. (I prefer instant read thermometers) I explain more about thermometers here. If you are using a regular meat thermometer, insert it about 2.5 inches into the deepest part of the turkey, without touching the bone. An unstuffed turkey takes less time to cook than a stuffed turkey. 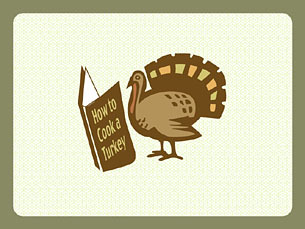 Shady Brook Farms has a great site that will help you to determine the cooking time of your turkey. Plus, they have a TURKEY HOTLINE! Call 1-800-810-6325 for all your questions! 5. Is Making Stove-Top Stuffing Cheating or Should I Stuff the Turkey? 6. Should I make gravy from scratch or just buy it? This video shows how to make gravy in advance. For lovers of Giblet Gravy, head over to The Pioneer Woman for a very well done photo-tutorial. 7. Now that the Turkey Is Cooked, How Do I Carve It? 8. Is Turkey Healthy and Why Am I so Tired After Eating It? Turkey is a great source of protein but the l-tryptophan can make you sleepy. Or maybe it’s just that you worked so hard preparing your first, utterly fantastic, turkey dinner! 9. Is There a Turkey Hot-Line for Emergency Questions? Of course! And there are real people on the other end of the phoneline! 10. What Kind of Side Dishes Do I Need and What About Dessert? And for dessert how about Pecan Pie! 11. What Do I Do with all Those Turkey Leftover? Cooked turkey can be substituted for any recipe that calls for cooked chicken. 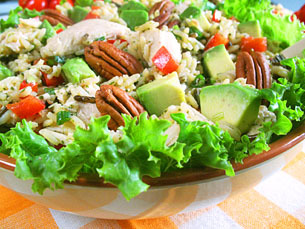 Chicken (or turkey) Salad with Wild Rice and Avocados (video) can get made in the morning and dinner will be ready and waiting when you get home from work (or shopping!). Chicken (or turkey) Noodle Soup is everyone’s favorite. This recipe takes less than 20 minutes to prepare. Chicken (or turkey) Salad is great made with walnuts and grapes! Caesar Salad often has cooked chicken add so why not some cooked turkey! Taste of Home definitely knows what to do with their turkey leftovers. They have a great list of the Top 10 Things to do with Leftover Turkey. I can’t wait to try this Turkey & Swiss Panini. The turkey hotline is so cool! I can’t believe that exists. The turkey hotline appeared in the first (I think) series of the West Wing! no stuffing in the turkey? ah non non non non ce n’est pas possible, je suis desolé! I don`t buy that USFDA advice for one single grandmother-minute! Time tested and honored.Generations of people have been Stuffing a turkey from time immemorial, or at least the mid 1900s. I think a qucik stuffing — the knd you buy in a store and add a few things to, are easy and fine for the startcooking crowd. I’m not sure, but I do believe the Turkey Hot Line has been around for at least 20 years! I have actually called it and the folks answering the phone could not have been nicer! Oh Will, I am so sorry you disagree with the USFDA! (I do particularly like that crispy crust the stuffing develops peeking out of the turkey but….) For a first timer, I’m still recommending the stuffing be made and cooked outside of the bird! I would like to know what people’s favorite side dishes are. in a pan with medium heat, I fry up some frozen pearl onions for a couple minutes, throw in the carrots and seasoning, and steam covered with with just a little bit of water at the bottom. 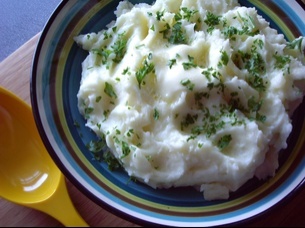 I throw in the parsley at the very last minute, and always the flat leaf kind: I think it is less sour and more fragrant. Red cabbage, roast potatoes (of course), roast parsnips. glazed carrots …. Jon, what’s bread sauce? Will, your carrots sound great! bake until bubbly at 350 degrees (about 30 minutes). Wow, your pearl onions walnut combo kathy sounds just incredible, I for-sure am going to try that. Horror story? Just this: finding the blade from the grinder in the bowl of stuffing. Giving thanks that I was the one who got it. Do I need to use cesar salt for a raosting a “self-basting” Turkey? yes, it’s going to be the first time..hopefully. Question about bread stuffing. How far in advance can you make it to be safe? Thanks Jon for the bread sauce recipe. It even sounds English! Here in the USA I don’t think I’ve ever seen the term “knob of butter” used. I love it! Susan, your story is really (really) scary! Gaurav, it is not necessary to use seasoned salt. Just regular salt and pepper is fine for seasoning a turkey. Peter, your stuffing should be just fine made the day before Thanksgiving. Good Luck to everyone making their first turkey dinner! it’s going to be the first time..hopefully. I bought a frozen turkey breast ~ 7 lb. I’m planing to brine it before roasting. On the brine bag it says brine for 20-24 hours. I checked on a website where they’re advising brining for ~ 12 hrs. What should I do? Guarav, follow the instructions on the brine bag. The more you keep comparing recipes the more confusing it may get! Call the Turkey Hot Line if you get stuck! Hi Gaurav! I’m so thrilled you mentioned brining! I’m bringing my 14 pound turkey, too. I’ve done this for the last three years and it comes out way juicier than not brining in my opinion. Definitely leave it in there for 24 full hours. That’s what everyone recommends, especially the king of brining–Alton Brown on the Food Network. I don’t recommend less than that! It is not going to hurt your turkey despite what that website you read says. Just make sure that you’ve got plenty of ice in there, and check the temp often. Can’t wait to hear how your first brining experience goes! You’ll definitely have a juicier bird! I am a first-time thanksgiving chef this year and I AM VERY NERVOUS ABOUT THE TURKEY. I am cooking 2 Turkey breast in my electric roaster. I have heard several different things but i want to run it by some other people. My plan is to just carve the turkey in the kitchen and serve it on a platter. Everyone always says ” cook it breast up,” but my mom says that she cooks hers breast down in a slow cooker because the breast meat will be more juicy. Also, does any one have a simple Baked dressing recipe? mroe questions…I am going to brine the bird. Do I still need to rub/sprinkle the turkey with kosher/seasonal salt before roasting (as indicated in the video above)? Yes! Seasoning your bird is a different issue than brining. Some people mistakenly believe that because the bird is sitting in salt-water that it takes on a heavily salty taste, and this is completely untrue. The ratio to salt in the water is not terribly high, so it does not impact your bird with a salty taste. You should season your bird as indicated in Kathy’s video after you’re done with the brining. I’ve already popped mine in the brine in a 5 gallon bucket I bought at Home Depot for a few dollars. Of course, you want to make sure your container is new and clean and used only for a foodie purpose such as this. Don’t try to use a bucket that was used to store something else or you’ll risk contaminating your bird. Gaurav, you mentioned you turkey was 7 pounds, so that might be small enough to fit in a large pot you already have in your kitchen. They key is to give the bird plenty of room and not try to cram it into whatever container you are using to brine it in. Good luck with your bird! Mahalo for these coking tips. I have cooked my turkey imu-style for the last 10 years but we have some company this year that wants a “traditional bird”. Thanks Lisa! You are clearly THE turkey expert! Hi Melissa! I hope I’m not too late to help you out! I make the following apple and sausage baked stuffing (or dressing, as you refer to it). I buy the pork sausage in the supermarket in a big brick. I personally skip the walnuts, but you don’t have to if you like them. 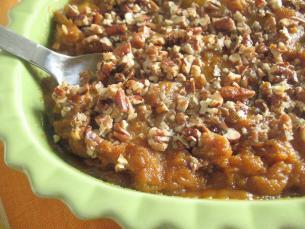 You could also check out this apple and raisin stuffing that’s right on the Pepperidge Farm website. If you’re in a pinch at this stage, just purchase your favorite brand of stuffing mix and buy the ingredients they suggest right on the bag and just follow them exactly. I always cook my turkiey breast up. For one, I think it squishes the turkey breast and deforms it if it goes face down, plus the breast is the largest part and needs lots of exposure to the heat. But there are plenty of opinion of up or down as you mom has already suggested. If you’re just cooking breasts (and you’re not telling us how large or small they are), your biggest concern is going to be dryness, as you don’t have the rest of the bird to pull moistness from–the breast always tend to be the dryest part of the bird. What I do with a full bird, is that I cook it at 500 degrees F for 30 minutes to get the breast browned, and then I lower the temp to 350 and take aluminum foil and make a cover just for the breast (we call it the “breast plate of armor” at my house). Then we wait for the breast to hit 165 degrees on our thermometer. 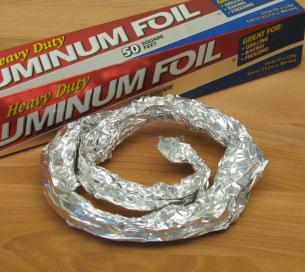 You could do a variation of the same thing, except you would cover your whole pan with foil to seal in the moisture and prevent dried breasts. But, you could also listen to your mom if her recipe is full-proof. I’ve never put a bird in a slow cooker, so I can’t attest if that actually works. But, it does sound like it works for her. Let us know how your bird breasts turn out. Turkey came out great….juicy and delicious. Thanks all, esp. Lisa and Kathy for their helpful comments. I hope other’s had a good lazy thanksgiving too. Cool Gaurav! Glad to hear your bird came out great with the brining! 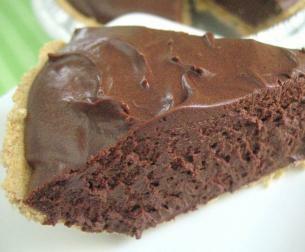 Ours was fab too, and the leftovers the next day were still terrifically moist even after reheating. Well, I’m sure we’ll all be chatting about our December holiday meal ideas shortly! I’m already planning a seafood feast. Looking forward to hearing what others will be doing. To Gaurav and everyone else who tried cooking their very first turkey…CONGRATULATIONS! For many new cooks this is a huge first step in learning to cook and I am so very happy for all you! Thanks for tuning to startcooking.com for help! My 1st Thanksgiving went GREAT!! I ended up cooking the (2) Turkey breast in the electric roaster with the breast down. It was perfect. Very Moist!!! I decided to go with a traditional bread dressing. I was worried for a minute but it turned out great. It was quite a task because I have to be careful when I cook due to the fact that my husband is a severe diabetic so I always plan my meals around his diet, including Thanksgiving. the only thing he couldn’t eat waas the dressing but he really enjoyed everything else. I just had to add this! I know that Thanksgiving is over, but here in the UK we eat our turkeys at Christmas (after all we don’t have Thanksgiving!). Anyway our Food Standards Agency (a bit like the USDA) has warned very strongly against washing your turkey. Anyway here’s the story. Terrific post, Kathy. I wish I’d had a guide like this for my first (or second or third) Thanksgiving dinner and it’s a good refresher course for us all. One thing I didn’t think of as a beginner is that the weight on the turkey’s label includes the neck and giblets, so my turkeys were always done sooner than I expected, which only added to the stress. Since then I deduct their weight and plan accordingly. Happy Thanksgiving to you and everyone at Start Cooking! I never thought about that but you are totally right! Thanks for the great tip! Which way do you put a pan in the oven?? The length of the pan front to back or side to side? Excellent post. It has been so long since I have cooked a turkey I had forgotten most of the things you put here. You rock! I am freaking out. This is my first year cooking a turkey and I have 15 people telling me 15 different things. I have a 13.71 lb turkey that is going to be brined in a savory turkey brine. I will be cooking in an electirc roaster with a turkey bag. I have no clue when to baste or how long to cook or even what to season this thing with. I am getting more and more confused. Can someone help me out or at least point me in the right direction? 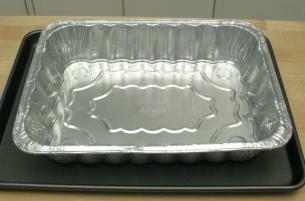 Here is a link on how to cook a turkey in an electric roaster. Epicurious has a great video on How to Brine a Turkey. Brining a turkey makes it juicy, tender and tasty. I’m sure yours will be wonderful! I always stuff my turkey with celery, carrot and onion, just to help flavor the bird. Those are then thrown away and I serve dressing that I baked in a Casserole dish. I know people who have gotten food poisoning because the stuffing inside of the bird wasn’t full cooked. Hi Elsia, Yes adding the vegetables to the turkey cavity certainly does add to the flavor of the bird. I sometimes even put in a cut up orange or lemon. I would still like to see a photo by photo guide to deep fried turkey. Those side dishes look great too (soup, salad, and deserts), which only goes to remind me, that it is a total experience, and not just getting the meat right.